Identification: This is a slender species that usually has two distinctive cup-like annuli on it's rhinophores. The annuli, however, may be irregular in young animals (and are sometimes absent). The body is translucent cream flecked with orange and white. The cerata often have dark orange to red-violet pigment basally, an orange subapical band and/or irregular cream axial streaks. 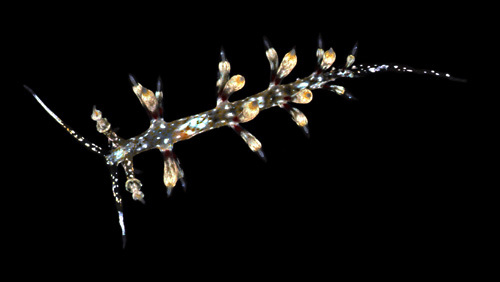 There are prominent cnidosacs in their tips. Natural history: Cratena sp. #1 is a moderately rare species found in moderately exposed rocky habitats at depths of < 1 to 8 m (< 3 to 26 ft). Distribution: Maui, Oahu, Kauai and Midway: widely distributed in the Indo-Pacific. Taxonomic notes: First recorded in Hawaii from Mala Wharf, Maui by CP on May 13, 1991. Photo: PF: 8 mm: Lehua Islet, Kauai; July 30, 1994.